Hey Lovelies! How was your Christmas? Did you celebrate at home, vacation somewhere or do something spontaneous? Which ever it was, I'm sure it was an amazing time. 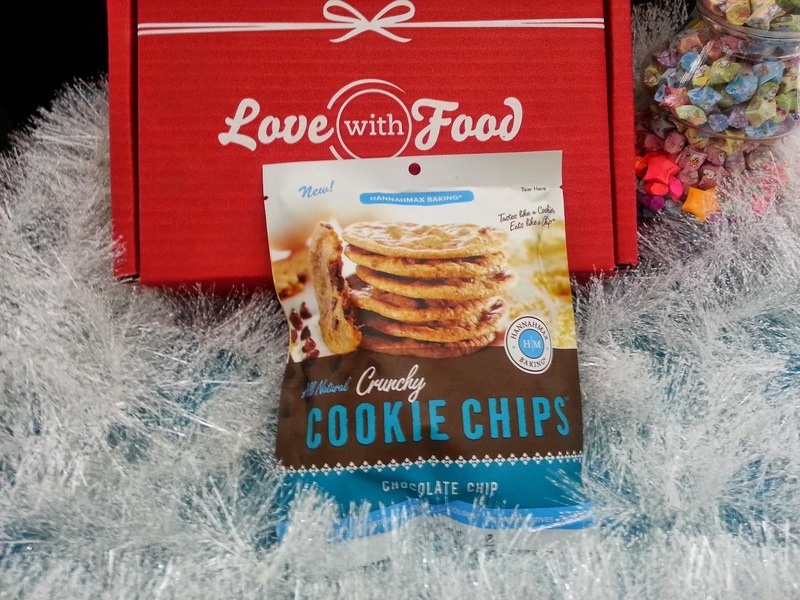 I am in love with Love with Food's December tasting box! When my mailman, who's used to delivering me pink Memeboxes, came last week to deliver this box he said "Hey it's red this time!" We chatted a little about how this is a snack box and he said he'd look into it because he love snacks too. I was so excited when I opened the box and saw all the goodies. I already have a couple of the snacks on my To Buy List because I like them so much. 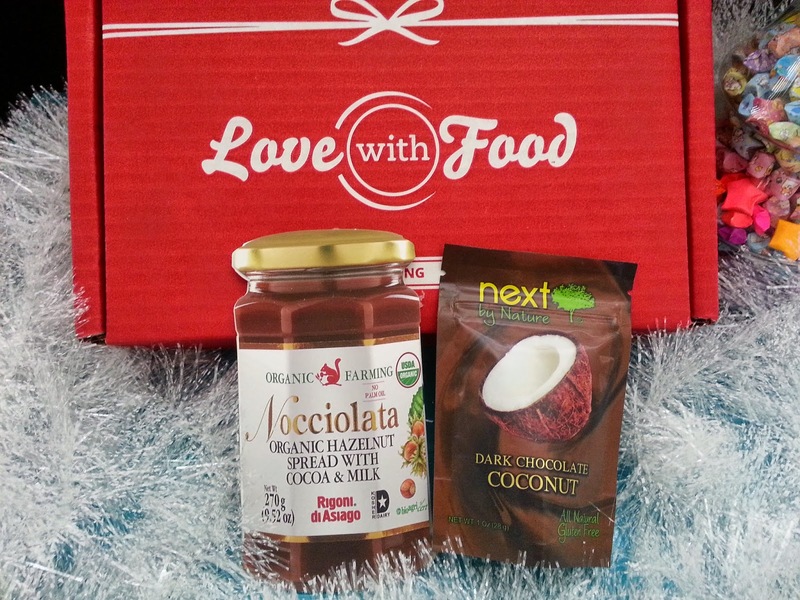 Let's dig in to see why this December Love with Food box is a perfect taste of the season! 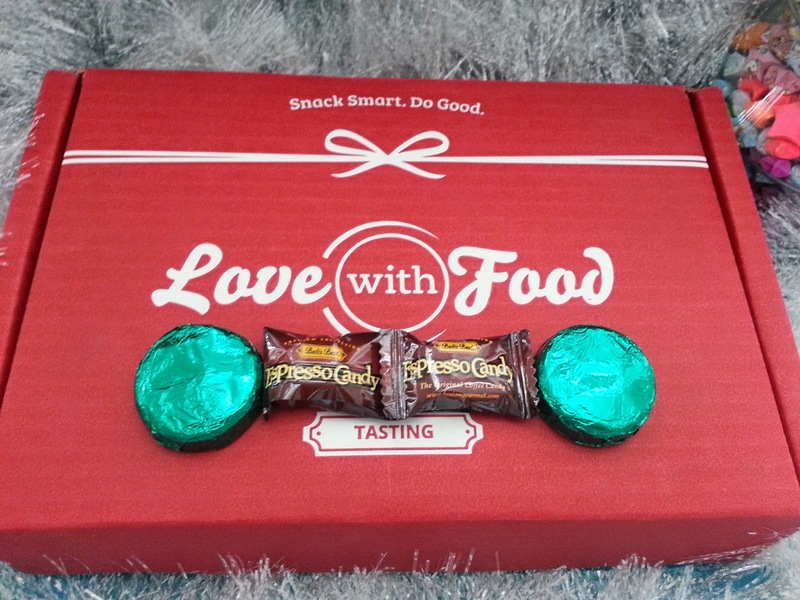 Love with Food is a snack subscription box that cost $10 plus shipping (which is $2). It comes with 8+ unique sample snacks that varies based on seasonal themes. Love with Food also donates a meal for every box sold to end child hunger. Pretty neat huh? 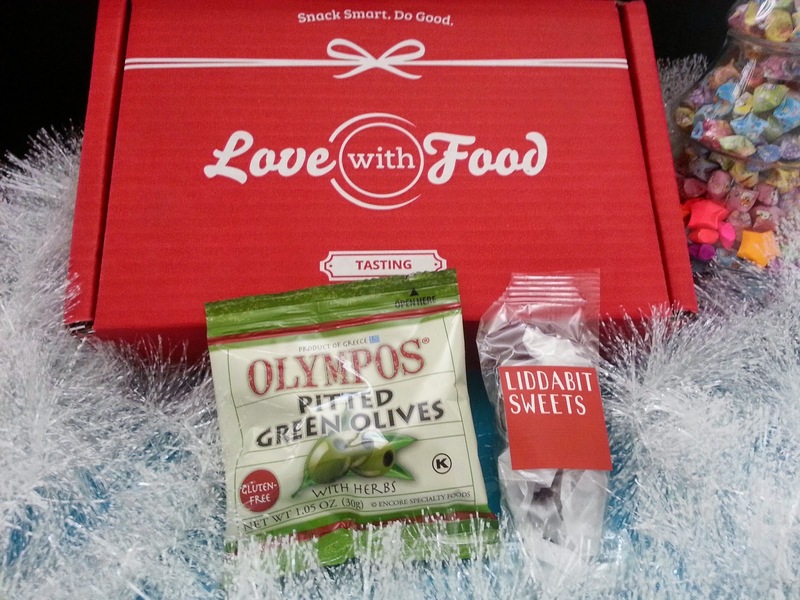 So far, Love with Food only ships within the US and territories, but maybe they will expand in the future. 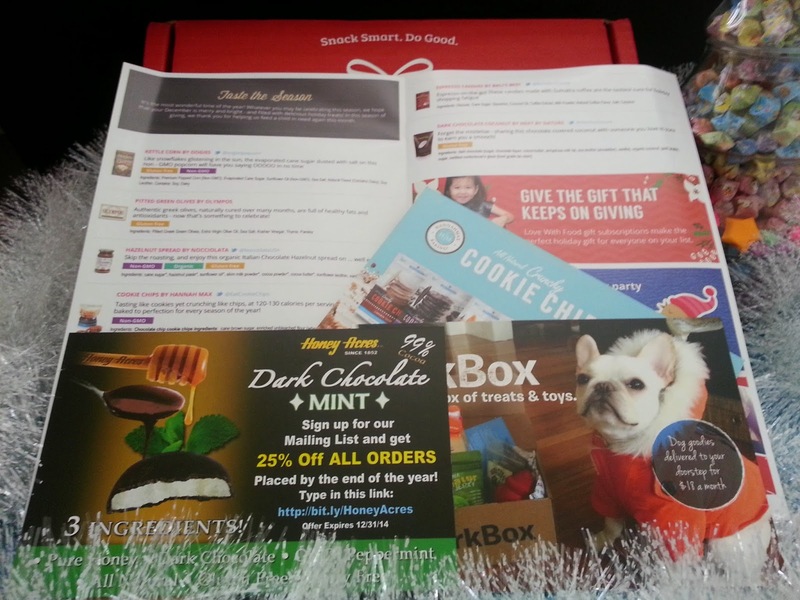 Aside from snacks, the boxes also includes coupons on products and other websites as seen in the picture above. It also includes a description pamphlet that lists each product's ingredients and information. Click my link here to get your first box at 40% off! I really enjoyed this kettle corn. The cane sugar coating added sweet flavor without over powering the popped corn. It tastes delicious! There's no artificial flavoring and they used non-GMO popcorn. 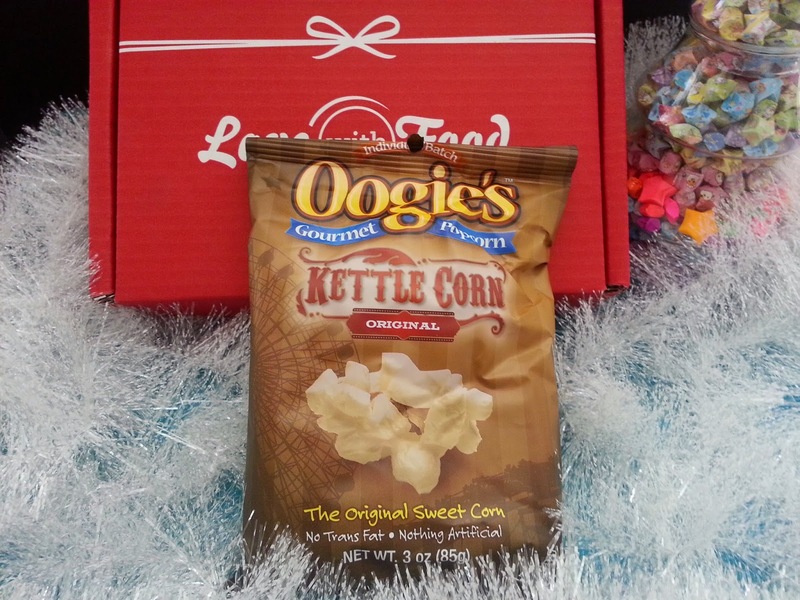 Kettle corn is perfect for the holiday season as well. I remember going to see the city's Christmas lights with the family and we'd get a big bucket of sweet kettle corn to share. We'd also get doughnut holes made fresh to order, which are bomb by the way. P.S. the kettle corn is on my To Buy List! These are pretty much crunchy cookies that are just thinner. While the flavor of these cookies were fantastic, I'm more of a soft cookie gal so these were not really my cup to tea. I did really love the flavor combination of the cookie though and if they came soft I would have loved them even more. But then, I suppose, if they came soft they wouldn't be cookie chips. Oh, I also want to mention that most of the cookies in the bag was broken in pieces when I opened mine. There was only 3 whole pieces, a bit sad, I kind of like my cookies whole. There's just something about it that's better than broken cookies. This is like Nutella with a milkier taste. I used it on my Hawaiian rolls for breakfast and it tasted great. What's even better is that this is an organic product and does not contain any GMO. I love coconut chips, they are delicious and make great snacks. Since these are dark chocolate covered coconut chips, I thought I'd love them. However, it's only so-so for me. The pairing of dark chocolate and coconut chip is a great choice and that is not the reason why I don't like it. Rather the issue lies in their coconut chips. It's too hard and not sweet enough to balance out the bitter dark chocolate taste. Good coconut chips are not suppose to be so thick or so hard like these ones. Compared to other coconut chips I've had, these are average at best. Let's just say it straight, I'm not a fan of olives. I avoid them at all cost, if they are on pizza, I take them off, if they are in salad I pick them out. So I gave these to my mom who happens to love olives. Her thought? She actually didn't like these when she had them plain. It was a bit better when she paired them with wine, however, she still didn't like the taste of the olives much. Can I just say that I am in love with these dark chocolate sea salt caramels and am so happy that Love with Food introduced me to them. They are delicious! Hands down the best dark chocolate sea salt caramels I've ever had. The combination of the flavors are perfect and it leaves me wanting more. These are definitely on my To Buy List! Ugh, is how I would describe these chocolate honey mints. I thought they would be delicious but the super bitter and unsweetened dark chocolate totally threw it off. Even with its minty honey filling, the bitter dark chocolate was too overwhelming and its bitter taste lingers in your mouth even after you've finished it. It might be a taste preference, but I did not like these at all. These tasted like most espresso candies I've had in the past. Nothing super special or unique about them. I did like the taste though. 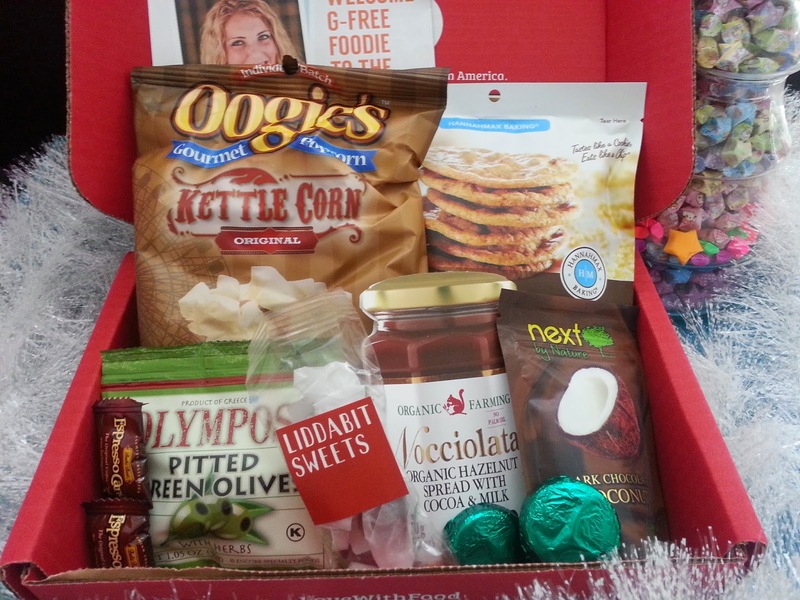 The December Love with Food box is my favorite right now. I found snacks that I absolutely love and want to purchase more of. I got to try a ranging of snacks and discovered healthier and organic versions of my favorites. Looking at you hazelnut spread. The selection of snacks was fantastic this month and I'm very happy with it. Cannot wait to see what's in next month's box! Disclosure: The products were purchased by me and all the opinions are honest and my own. 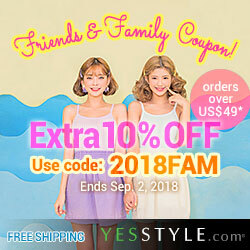 This post contains referral links and thank you in advance if you choose to use them.